Smith’s Bridge, a steel structure that spanned the French Broad River between Asheville and West Asheville, in the midst of the flood, with portions already gone. Within a day of this photo, the remaining parts of the bridge were swept away as well. On Asheville’s riverside South Depot Street, the Southern Railway Station, streetcars, and a grocery were swamped. Estimates of the death toll from the flood ranged from 50 to 80. Hundreds of miles of Southern Railway track were torn apart by the flood waters and landslides. The raging Yadkin River destroyed the Narrows Dam in Stanly County. Railway workers braved a portion of track between Old Fort and Ridgecrest, where the earthen support had been completely washed out. A crowd of onlookers in Biltmore Village gazes at the site where four residents drowned after clinging for hours to the top of a mostly submerged tree next to the Swannanoa River. A woman surveys the devastation in Dillsboro, where scores of homes were crushed by both flood waters and landslides. We can witness some of the damage in black and white archival photos, and learn more of it from faded newspaper clips. But it’s still hard to grasp the extent of the cataclysm that was the Great Flood, Western North Carolina’s biggest natural disaster in recorded history. True, there have been massive gully washers here before and since. Spring rains in 1791 were so heavy they raised floods that Davy Crockett called “the second epistle to Noah’s.” And as recently as September 2004, the one-two punch of hurricanes Frances and Ivan devastated many mountain towns. The most notorious occasion fell in July of 1916, when waves of record-breaking precipitation piled up. The first week of the month, the remnants of a Gulf Coast hurricane soaked WNC, and the rains never seemed to stop after that. Then, on July 16, a hurricane from the Atlantic brought an additional onslaught. At one local weather station, 22 inches of rain were recorded in 24 hours. At the time, flood stage on the French Broad was marked at four feet over the norm; the combined storms pushed the waters to a crest of more than 23 feet. The river, which averaged 380 feet in width, swelled to more than four times that span. As riverside residents began to seek higher ground or, in some cases, drown, houses on waterlogged mountainsides cascaded down in landslides. In several interviews after the flood, that’s what people emphasized: the sickening sound of a home sliding down a ridge, sometimes with a family inside it. Like other epic floods, WNC’s became ingrained in local history, and it lives as a shock to the region’s system that reverberates on and on. The catastrophe also rocked communities in South Carolina, Tennessee, Virginia, and West Virginia, but bearing the brunt was North Carolina, and especially Western North Carolina. Exactly how much loss did the flood wreak in the mountains? Contemporary accounts suggest grim numbers: 50 to 80 people dead with hundreds gravely injured, thousands of houses destroyed, and untold businesses suddenly washed out. Hundreds of miles of railroads, a key means of moving people and goods, were disabled. When the waters finally receded, the financial damages were estimated at some $22 million—the equivalent of almost half a billion dollars today. And while it’s sometimes referred to as Asheville’s Great Flood, the disaster was hardly limited to WNC’s largest municipality. In Marshall, Main Street was deluged with eight-foot swells and 58 homes were destroyed. In Henderson County, several main roads disappeared, with the county seat, Hendersonville, accessible only by boat. Rutherford County provided a grim newspaper headline: “Village of Chimney Rock Reported Gone.” The greatest single loss of life occurred in Gaston County, where 10 railroad workers drowned after a failed effort to stabilize a trestle on the Catawba River. Certainly, no community had a monopoly on the destruction. Throughout the region, textile and furniture mills, bridges, dams, and roads were washed into oblivion, while mountain crops took a beating, raising the specter of starvation that was addressed in earnest but only in part by local charity drives and state and federal aid. The mountain practice of canning food for the coming year was one of the few saving graces. The broad scale of the devastation left behind deeply personal stories that seared the area for generations. In one especially tragic example in Asheville, a few nurses from Biltmore Hospital and a family from Biltmore Village got picked off, one by one, by the rising waters as they clung to the upper reaches of a tree. Hundreds of neighbors looked on helplessly. After valiant swimmers failed, rescuers in a boat ultimately saved the sole survivor, a young girl. Hours earlier, her father, a superintendent at the Biltmore Estate, had used his coat to secure her to a branch, only to succumb to fatigue and slip away to his death. A short distance away, residents of the Glen Rock Hotel were stranded by the waters. Two local men volunteered to deliver food and water to them, via a boat, but it capsized amidst the violent current, and they drowned as well. On July 20, as the waters subsided, an editorial in the Asheville Citizen decried the town’s lack of planning for such an eventuality. 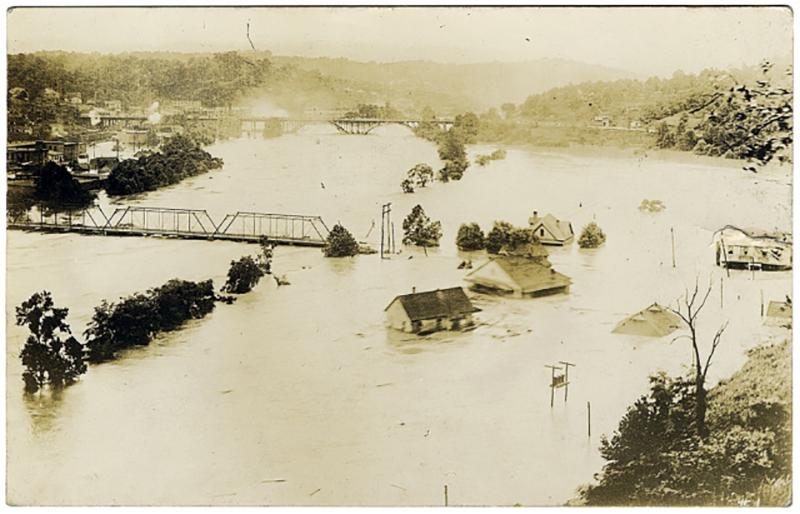 “Had Asheville anticipated the flood,” the newspaper said, “she would have been prepared against it by having her river banks in the industrial district planted with trees … and the piers of the bridges in this vicinity would have been far enough apart and the arches high enough to allow the free passage of wreckage and debris.” What’s more, the newspaper campaigned against artificial lakes, given the devastation downstream from burst dams. Even today, 100 years later, the Great Flood remains an unavoidable reference point for urban planners, emergency managers, residents, and environmental advocates who want to mitigate the impact of future disasters. That is clear from the work of the Center for Cultural Preservation, a Hendersonville-based nonprofit that collected stories from descendants of victims and produced a new documentary on the flood, Come Hell or High Water, that debuted in June. “So many of the mountain elders we talked to had connections to the flood,” reports David Weintraub, director of the center and the film. “When something like this happens, families pass the stories on and on and on, and they’re powerful,” he says. A key lesson learned, he adds, is that while we’re accustomed to thinking of flood damages coming from below, in the form of rising waters, “some of the greatest devastation came from above, with the landslides on many steep slopes.” Building on such peaks, he counsels, can remain risky today, even with modern improvements in construction. Landslides stemming from the September 2004 storms were a testament to that, he says. Screenings of the new documentary by the Center for Cultural Preservation will take place throughout WNC this summer. Visit www.saveculture.org for details.